Hi everyone! Oh my, this is two weeks ago already and I haven't told you about this yet! Shame on me... It was the weekend before me birthday and that always means: The Olympia Stitch & Craft Show is on! I wasn't sure if I should be going this year, with the whole not working at the moment thing and spending money issue. But then I figured that I deserved a little birthday treat and I have been extremely careful about spending money since I became a lady of leisure so to speak ;) Plus with the knitting magazine subscription that I won on FB a few months back, I actually got 50% off the entry ticket, and that was what made the final decision for me. I was going to the Stitch & Craft Show! Hello again everyone! It is official, I am done with the egg hunt, I found all 209 eggs! Sadly egg 57 will not be made, so that means I am finished :) Have you all been seeing the updates on zone 5 and zone 11, where I show you the final 3 eggs I was still missing last week? I can't believe it's over, though having spent the last week without the egg obsession was actually really nice, hihi. There is one more thing I have to show you though, besides the collage of course! Yes, I am now able to make the final collage, it came out really well I think! I couldn't get the exact format I wanted but the one I could do worked out better actually so it's all good. Yes, I'm totally excited! I have also allowed myself to txt in 3 codes so who knows I may actually win the grand prize! It has a chance of about 1:1 million but one can always hope ;) So do you know what the grand prize it? Let me show you, this is so eggciting! Yes yes, I know what you're all waiting for, you want to know who won the giveaway! I used random.org to generate the winner and in a way I guess it's a good thing that I didn't have 100s of comments as Blogger has changed some things around and now my comments are no longer numbered. Oops... But with my ingenious counting skills (just kidding of course), I managed to find the correct entry, and the winner is: Cherry Lane! Hi again all! I hope you're outside and enjoying this fine weather also :) Not me as I tried going outside and the wind is just horrible! BUT the light is just perfect for some projects so I'm busy being very crafty yay! Don't forget, you have about 7 more hours to enter the giveaway, so please click here to enter if you want to win one of my fabulous teacup pincushions :) On Monday the store will go live so you will have a chance to be the owner of the first ever MBCL creation! The light is perfect for crafting today so I'll continue now, I just wanted to remind you of the giveaway :) Good luck everyone and have a wonderful Sunday! Birthday Report - I'm Old! Hello again! As you may have heard, it was my birthday last Wednesday. Oh my I feel so old now! But I had a lovely day, despite not being at work and being congratulated all the time, or getting an office birthday present (although that would be a first anyway!). I went to St James Park to find one of the eggs that had recently been restored. Yes, we're not entirely done just yet! It was nowhere where I thought it would be, but I found it in the end :) I of course also posted this in my post about zone 5 to make it more complete. I'm nothing if not organised! I find that giving London a chance has really made me appreciate it more. I suddenly notice all the old buildings and statues a lot more. This is one of the royal buildings, and even the street lights are wearing crowns! When I came home, the bf was there already with flowers and presents. :) He got me this cute basket with flowers, so adorable! A long long time ago, before the glory days of Pinterest, I found a wonderful tutorial on how to upcycle corks and make a trivet out of them. You know, those thingies you put your hot pan or teapot on so you don't burn the worktop in your kitchen? The bf likes to drink wine and I always threw the corks away which was quite a waste. So I started to collect them. Sadly for this project I needed quite a few corks and it really took me nearly a year if not longer to get the right amount of corks. But just look at all my lovely corks! The tutorial said to cut them all in half which is what I did here. I used a potato knife, maybe that's why they all have a hole but the idea is there. Heyhey everyone, It's my birthday today!!! I feel so old... ;) I didn't do very much today but had a lovely time working on my cross stitch in the park, it's really starting to take shape. The cross stitch, not the park ;) I also found one of the eggs that had been destroyed by some moron and the artist had to remade it. But it's now back on display, so provided they bring back the two missing ones, I only have 2 to go. SO SORRY for Spamming LinkedIn Invites! I am so sorry about this, I was just on LinkedIn and pressed a wrong button and now LinkedIn has sent out emails to everyone in my entire inbox!! Please feel free to ignore this request. I'm trying to do damage control but I have to do it per message and I think it sent about 400... So much for going to bed on time... Once again, so sorry and please just delete it if you see it. Heyhey! I have discovered something brilliant!! Well, maybe someone else thought of this a while ago but for me it's new. As you may know, I love baking bundt cakes (or as I call them 'Gugelhupfs'). I also love dusting them with icing sugar instead of glazing them. 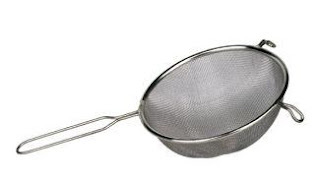 This is the sieve I use now. Yes, it's a tea-strainer! I just found it in my utensil draw and had a total epiphany! 'Light dawns on marble head' so to speak. All you need is a tiny closeable tea-strainer and some icing sugar. Fáilte everyone! That's Gaelic for welcome and appropriate for this time of year ;) I was going to blog much earlier but somehow one day of St Paddy's turned into two so I have more to tell and show you. As it would be just me this year celebrating, I kept it simple. London Faberge Egg Hunt - I found Wally!